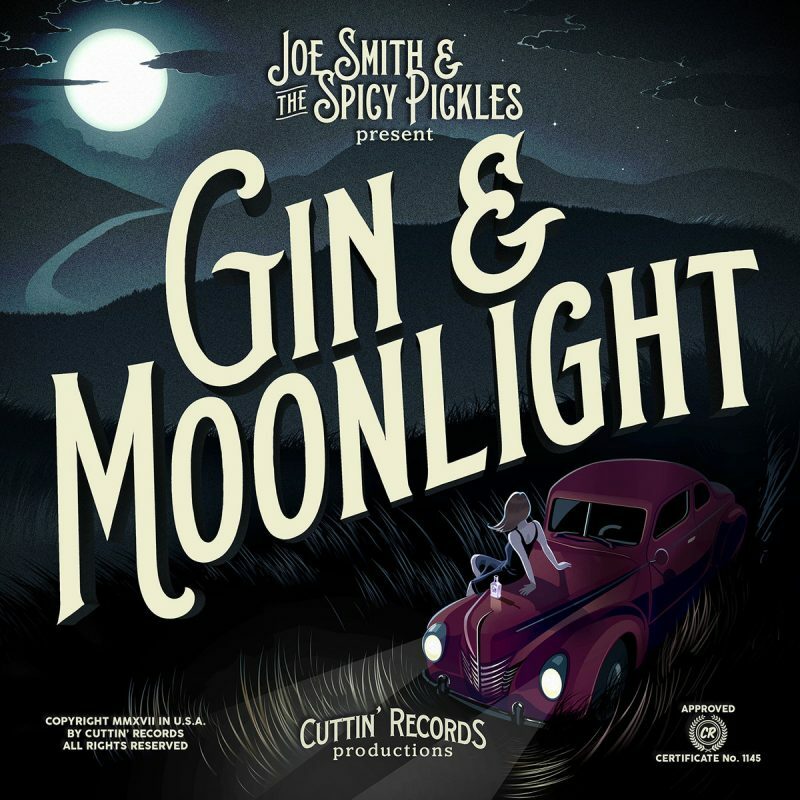 Joe Smith and The Spicy Pickles – Gin & Moonlight – Album Review | The Ark of Music – The best music in the world…you never knew existed. After a long childhood history with music—which included being paid by his grandmother to practice at age five—band director, trumpet player, and vocalist, Joe Smith, started the Denver, Colorado–based swing group, Joe Smith and The Spicy Pickles, in January of 2013, devoted to revitalizing swing music and dance. 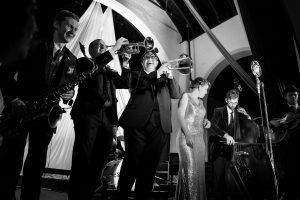 Inspired and influenced by the genre-greats such as, Squirrel Nut Zippers, Big Bad Voodoo Daddy, Count Basie, Fats Waller, Duke Ellington, Royal Crown Revue, and more, this seven-piece outfit of swingadelic noisemakers currently consists of: Joe Smith (trumpet, vocals), Matt Burchard (clarinet, tenor-saxophone), Decker Babcock (trombone), Luke Smith (guitar), Braxton Kahn (drums), Gary Sloan (bass), and Cara Griffith (vocals). With their previous work, which includes 2013’s Extra Spicy, 2014’s Rocky Mountain High, and 2015’s High​-​Fidelity, the spicy bunch have recently released their fourth studio effort, the funky and wild, the smooth and groovy: Gin & Moonlight. Opening with, St. Louis Blues, & Where’s Gary, the seven waste no time creating that old-school cocktail-lounge vibe, clearly tipping their hats to a named influence in Royal Crown Revue. The easy-does-it vibe and Griffith’s smokey vocal timbre in, Moonglow, make it hard to focus on a Saturday night. Would someone put this on a soundtrack already? The aptly titled, Mirage, switches tempo—transitioning from mysterious to curious—with the drop of a dime at around 1:03, and back again at 3:30. It’s just cool stuff. Think: Cigars and cocktails. Think: a smokey haze on the ceiling. Think: a bass-line in your bones, the lights down low, and your cares are behind you—for at least tonight. Music like this prevents all work from getting done; including, ironically, my own. Which brings me, reluctantly to some semblance of a point, which is this: With only seven members, Joe Smith & The Spicy Pickles, could be called minimalist in numbers, but are in absolutely no stretch of the imagination minimalist in sound and spirit. Clever and familiar riffs pay homage to the genre’s figureheads, while interesting thematic & tempo changes keep things fresh and new—both lyrically and musically. Speaking of which, how often does one come across of voice that needs nothing at all? No harmony. No reverb. Nothing. Such is the case with the Pickle’s, Cara Griffith. BELOW: Listen to Joe Smith and The Spicy Pickles album, Gin & Moonlight, and connect with their website and social media platforms. Please support Joe Smith and The Spicy Pickles by visiting them online, and playing, downloading, and/or purchasing their music, or attending a live show! And, as always, thank you for supporting real music!